Expired 1y ago . Last validated 1y ago . Used 49 times. 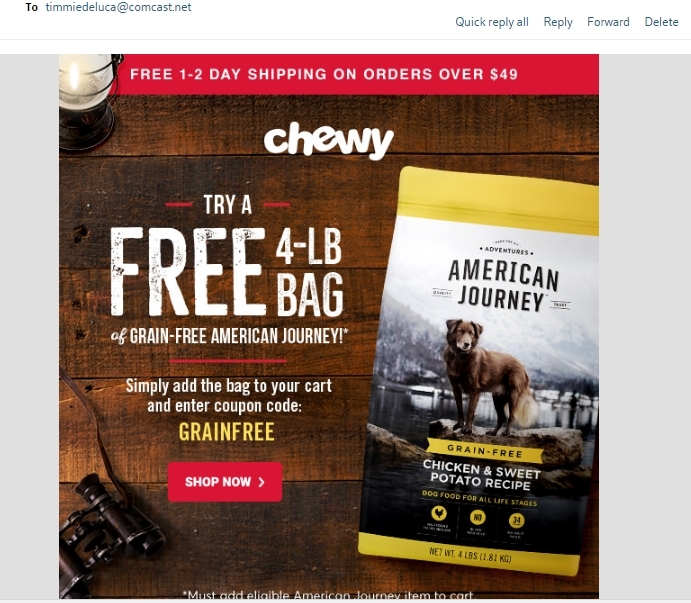 Laura DeLuca American Journey promotion is limited to 1 use per customer and is valid only on your first 4-lb bag of American Journey grain-free dry dog food. To redeem, cart must contain one eligible 4-lb bag of American Journey grain-free dog food and must enter the code GRAINFREE at checkout. 100% discount will be applied to the first eligible 4-lb bag of American Journey grain-free dry dog food. Limit 1 free item per customer. Offer subject to change. Limited time only, while supplies last.